My parents were in town this past weekend! My family is close, and we had a great time--we went to a great restaurant Friday night, went hiking on Sunday, and hung out all day Saturday. 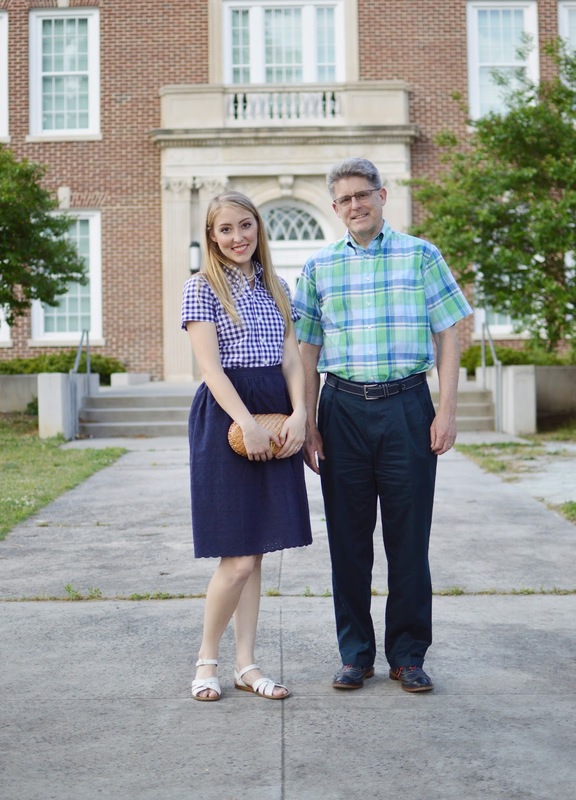 I took the opportunity and borrowed my dad for a photo or two in honor of Tanya's Dress Like Your Grandma Challenge! 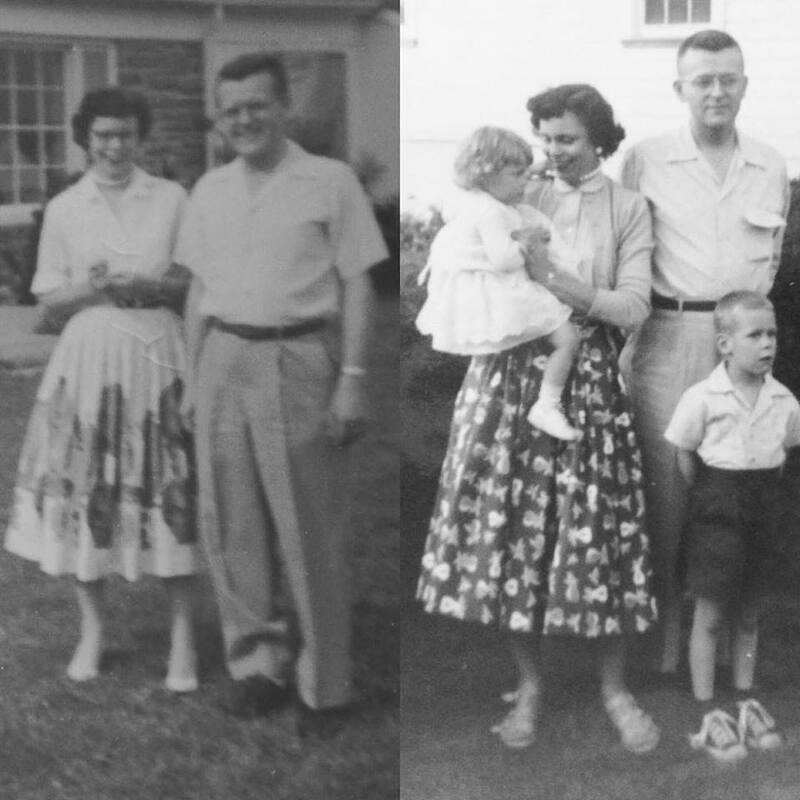 We don't have a lot of family pictures, but my dad sent me two photos of his mom, my Nana, in the mid-50s and funnily enough, she was wearing a full skirt, pearls, and a button-front shirt in both! Obviously, this was a practical, comfortable "uniform" for her everyday life, just adding a cardigan if it got chilly. I found it to be really touching, since I tend to wear basically the same thing, 60 years and two generations later (and have the closet full of gathered skirts to prove it). I don't look much like her (although I'm practically twins with her daughter, my aunt) but we dress just alike! Of course, I've modernized mine a bit--you know, that's kind of my thing--so rather than striving for authenticity, I've forgone the tiki(? 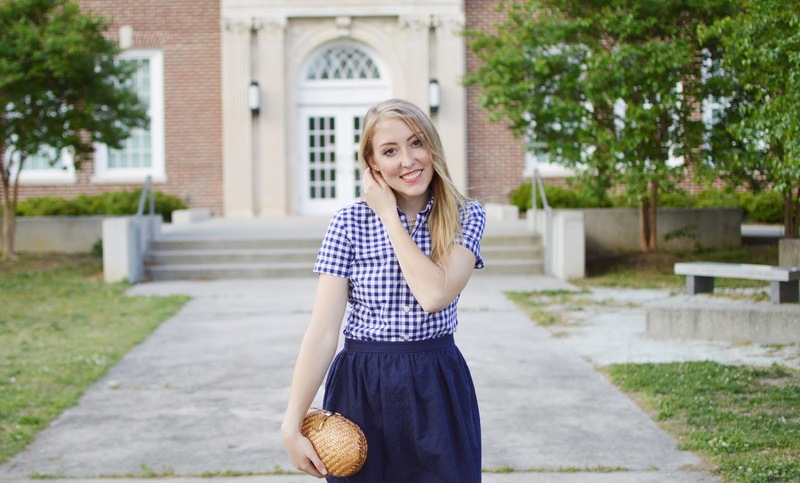 )-print skirt for one in leftover navy eyelet (from this dress) and made my button-front shirt in a smart navy and white gingham shirting for a look that's preppy and fresh. My skirt is a simple gathered skirt with a zipper and hook and eye waist closure. It's the same exact skirt you can see here and which I teach an online class about making! It's a great beginner project because you can make them in a million colors and prints and have a whole skirt wardrobe. As I said, I have a closet full of them: in pretty floral, coral cotton sateen, chambray, gingham, a neon pleated variation... and now this one in eyelet! This challenge was one of those things that got started and I thought "why didn't I think of that?" It's just such a cute idea. Plus, it got me to finish my Granville, which I cut out literally months ago. Having a go-to button down shirt seems like a handmade wardrobe staple, but every time I make a shirt I hate doing it. I know some people love making shirts... I am not one of those people. I do think I'll have to buckle down and make some more though, because the fit on this pattern is so good on me. This is with no alterations and the fit through the shoulders, bust, and waist is all spot on. Do you love shirtmaking, or do you prefer to stick to dresses, like me? I don't know, I guess I just love all the ruffles and gathers that come along with sewing dresses... and not all the precision topstitching that shirts require! ps: as i mentioned on my instagram stories, the fit of this shirt is great and I do hope to make several more of this shirt... i may leave off the collar however in favor of a simple bow tie neck. collars, ugh! Yours is the second post I've read this morning in response to Tanya's challenge and I must say they have been a real joy for me to see and read. I was born in 1954 so the "old fashioned" styles look familiar to me but it's fun to see how they are interpreted and modernized by your generation. 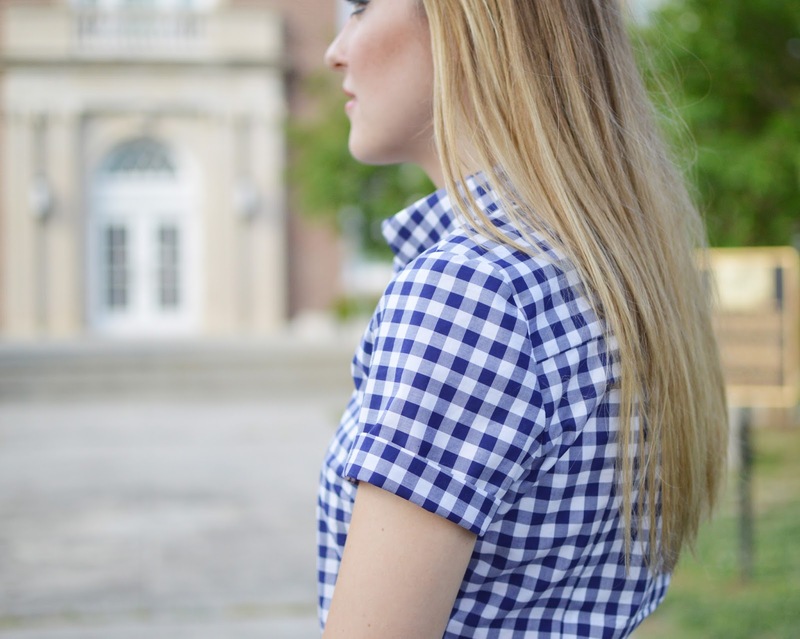 Love your blouse - so beautifully made with buttons at the collar to hold it down! I love these posts so much!! The cat lady challenge is still my favorite, but this comes in a close second. I love seeing the old photos and hearing about families. 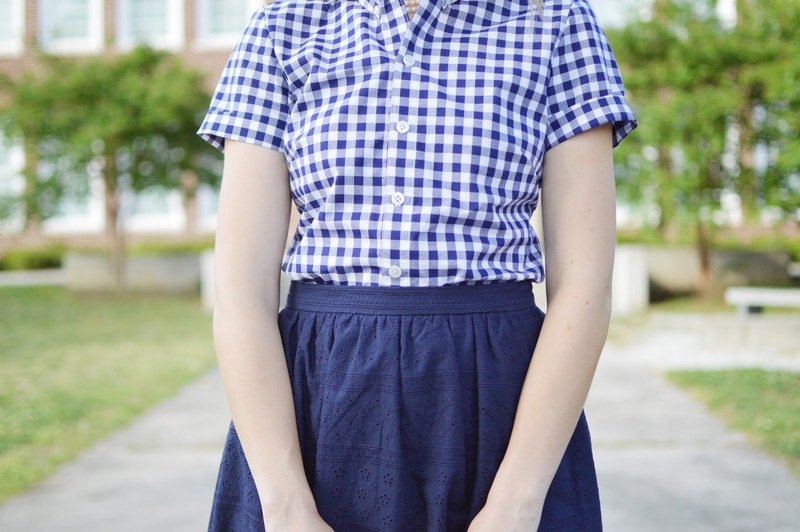 The clothes are great too :) I love the gingham shirt! I am a shirt sewer for sure--it's kind of a form of therapy for me. No one step is too hard, but concentration and precision is required the entire time. It gets me out of my head! I love this outfit! I really enjoy making shirts, and I've made 4 long-sleeved Granvilles already. I love how you did a cuff on your short sleeve! I need to make some because it sure is getting hot here in GA. Thanks for all your great posts. I love your style!